Adorable little vegan peeps that you can make yourself! Regular marshmallow peeps that you buy at the store have gelatin in them and are therefore not vegan, but don’t worry you can make your own! My vegan peeps recipe uses agar agar instead of gelatin for a vegan marshmallow. You can make them into chicks, bunnies, or any shape that you like and dust them in the colored sugar of your choice. 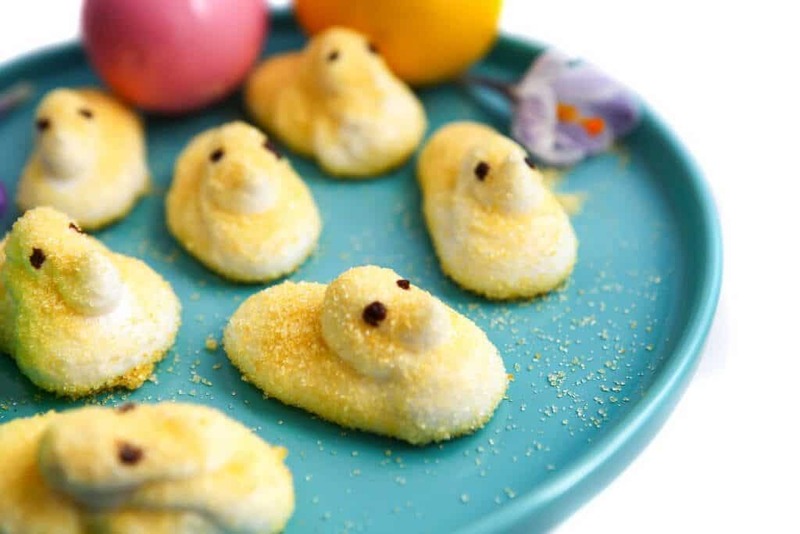 To make peeps, I use my recipe for vegan marshmallows and make some adjustments to form it into the peep shape and coat it with vegan colored sugar. 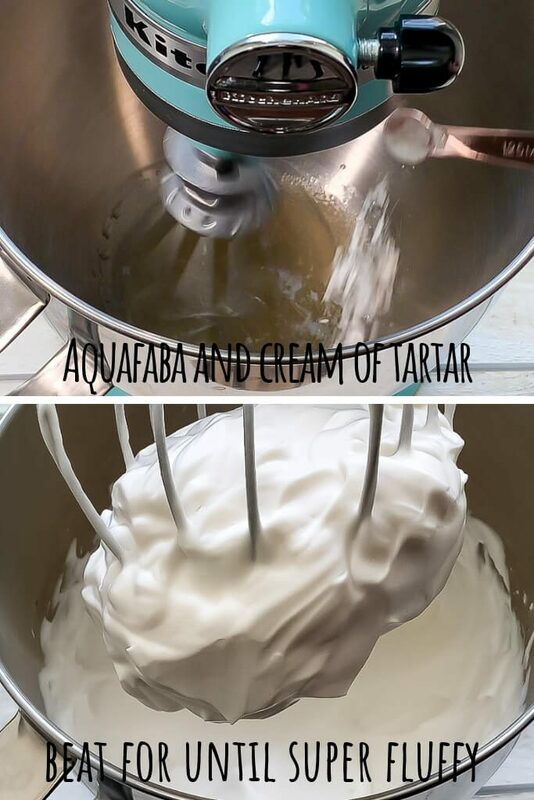 Aquafaba – this is just a fancy word that means the liquid from a can of chickpeas or another white bean. Cream of Tartar – this is an acid that comes in a powder. You can find it in the spice aisle at any local supermarket. Vanilla Extract – clear vanilla will give you a whiter marshmallow, but regular brown vanilla works great too. Sugar – and vegan granulated sugar will work. Whiter sugar will give you whiter marshmallows. Water – to make a solution of agar agar, sugar, and water that will firm up your aquafaba. Agar Agar – this is a vegan gelatin that is derived from seaweed. It can be a little tricky to find and expensive at a natural foods store, but I order mine from Amazon or get it at my local Asian market. Use the powdered version, not the flakes! Colored Sugar – for dusting the marshmallows. (You can easily make your own with granulated sugar and food coloring). Chocolate Chips – just about a tablespoon to melt and use to dot eyes onto your peeps. 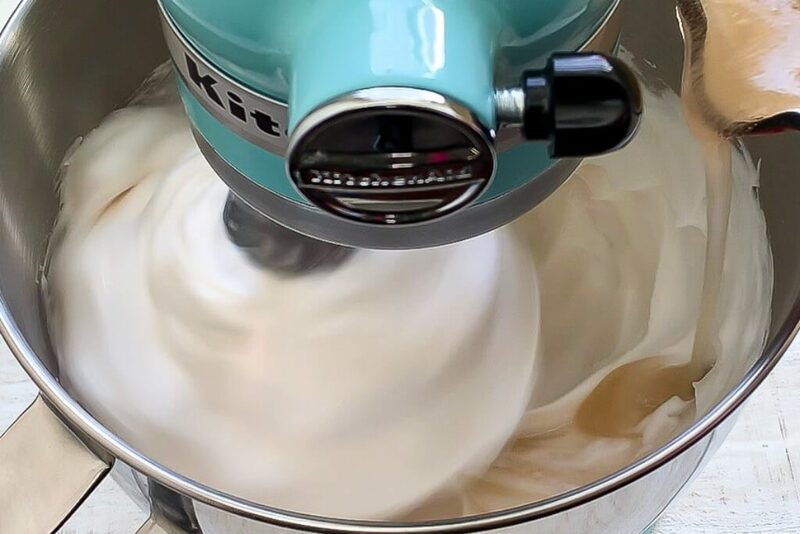 Mixer – you can use a hand mixer, but a stand mixer is a lot easier. Saucepan – to cook the water, agar agar, and sugar solution. Rubber Spatula – for scraping out the agar agar syrup. Piping Bag – for piping out the marshmallow mixture into peep shapes. Large Round Piping Tip – to fit on the end of your piping bag. Cookie Sheet – for spreading out the colored sugar and piping the peep onto. How do you make vegan marshmallow peeps? Fill the bottom of a small cookie sheet or tray with colored sugar and set aside. (See instructions below on how to make your own). Have a piping bag ready with a large round tip assembled and ready to go! Boil the water and agar agar for 3 minutes stirring frequently. Add sugar and boil for another 3 minutes stirring constantly over medium-low heat. (Be careful not to cook it too hot or you will burn or caramelize the sugar). Turn off the heat and add the hot sugar mixture into the beaten aquafaba. Add this mixture slowly while beating aquafaba with a mixer set to low. This will turn the fluffy white mixture a little shiny. Quickly transfer it to a piping bag with a large round tip. Pipe out your peeps directly onto the colored sugar. (Do this as fast as possible since the marshmallow will set once it cools). 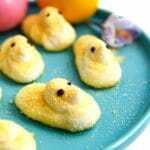 Sprinkle the tops and sides of your peeps with colored sugar. Melt chocolate chips in a very small bowl in the microwave for 1 minute and use a toothpick to stir the chocolate and dot eyes onto your peeps. You can eat them immediately or let them sit out in the air overnight to dry out a little more. (After 24 hours, store in the fridge). Whip the aquafaba for a full 9 minutes before adding the agar agar syrup. Stir the agar agar mixtures constantly over medium-low heat, just hot enough to keep it slowly bubbling. Make sure to cook the agar agar for a total of 6 minutes to make sure it’s completely dissolved and melted. Be sure to get all of the agar agar syrup into the aquafaba! Use a rubber spatula to scrape out the bottom of the saucepan to get it all. Have your piping bag ready to go before adding the agar agar syrup to the aquafaba! It cools quickly and you have to work fast! If it starts to harden in the mixing bowl, turn on your mixer for about 10 seconds to get it smooth again. Most colored sugar that you find at regular grocery stores have confectioner’s glaze in it. Confectioner’s glaze is made from crushed up insects and is therefore not vegan. You can read more about colored sugars and sprinkles in this article from PETA. Piping your peeps into the right shape was the hardest part of this recipe for me. (I’m not good at piping in general and it took some practice). You may find this YouTube video helpful. 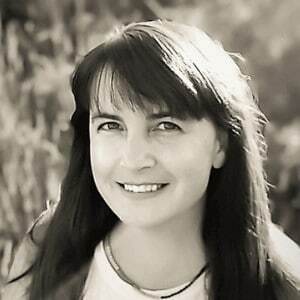 She makes traditional peeps and not vegan ones, so skip ahead to 3:05 to where she pipes them out. The vegan version is not quite as sticky and stringy as hers, but watching the piping process will help. 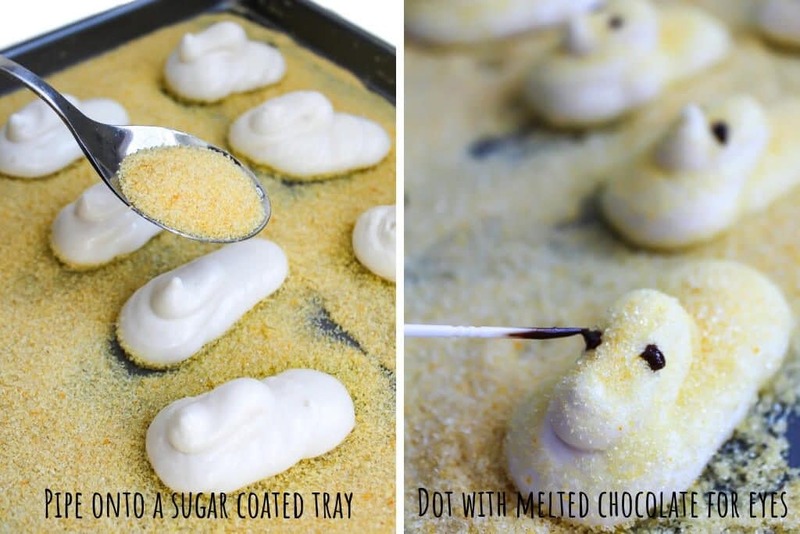 If you don’t want to pipe your peeps – You can use my regular recipe for vegan marshmallows and use colored sugar instead of the powdered sugar. After they cool, use cookie cutters to cut out the shapes that you want and dust them again in colored sugar. 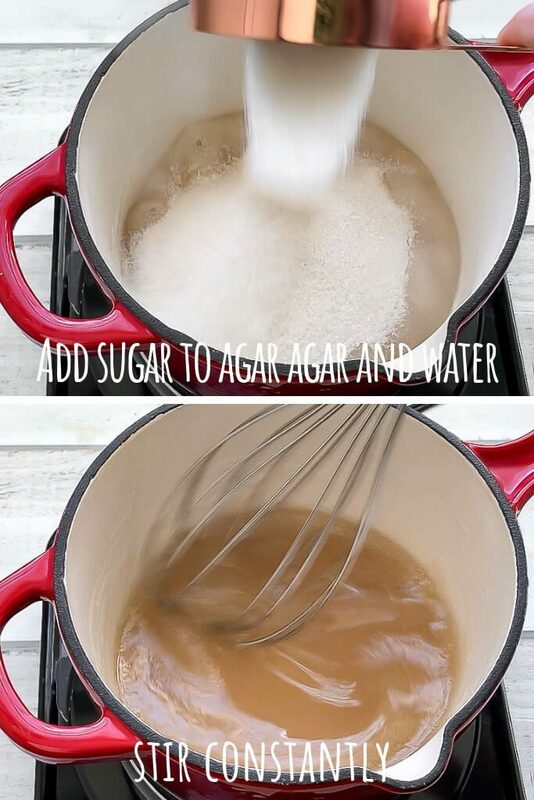 How do I make my own vegan colored sugar? It is easy to make your own colored sugar with just granulated sugar and natural food coloring. Simply place 1 cup of sugar into a food processor and drop in about 6-8 drops of liquid coloring into the sugar. Pulse a few times until the color appears to be even. Then pour the sugar through a wire mesh strainer and sift out any clumps of food dye. Sift the sugar onto a cookie sheet and let it dry out a little. Use as sanding sugar to decorate any of your vegan desserts or store in airtight containers for later. Be sure to follow me on Instagram for daily vegan inspiration and links to all my recipes! Vegan peeps made from vegan marshmallows and coated in colored sugar. Fill the bottom of a small cookie sheet or tray with colored sugar and set aside. Add some vanilla extract and whip for 3 more minutes until it is white again and it forms very stiff peaks.In a small saucepan, combine water and agar agar and bring to a boil. Add this mixture slowly while beating aquafaba with a mixer set to low for about 30 seconds. This will turn the fluffy white mixture a little shiny. Make sure to cook the agar agar for a total of 6 minutes to make sure it's completely dissolved and melted. If you don't want to pipe the peeps, you can follow the directions for my vegan marshmallows and cut them out with cookie cutters. These are beyond adorable…you are so good at making these look great! OH my goodness! How awesome are these! I would have never thought to make my own peeps. I love them and now don’t have to miss out. Thanks for sharing! Oh my gosh, these are adorable! You know, my husband has always hated peeps, but I’m betting he would love these. These are SO cute! It’s a great way to use aquafaba that isn’t just whipped cream! These are darn adorable! I don’t think there are any commercial vegan peeps, are there? Yours look way cuter, too! 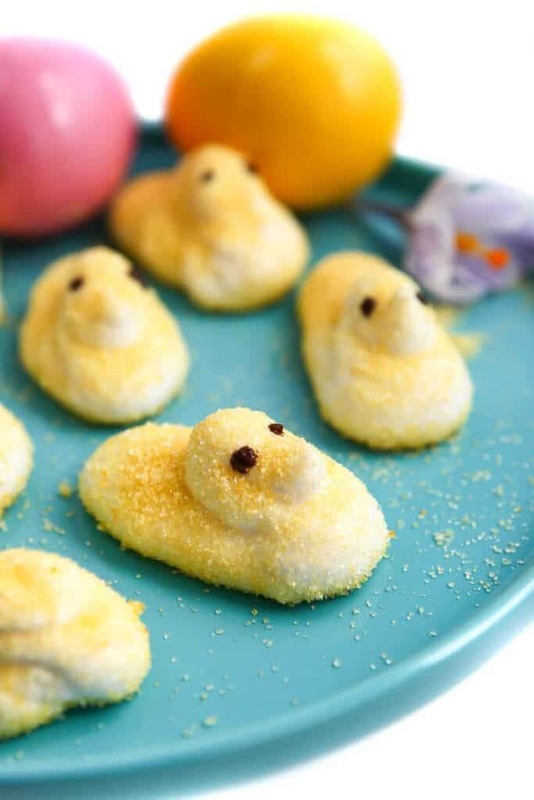 These would be so fun to make with my kids and probably taste better than actual peeps!